Officials say there is no clear sense of what's causing the radiation spike or how to stop it. 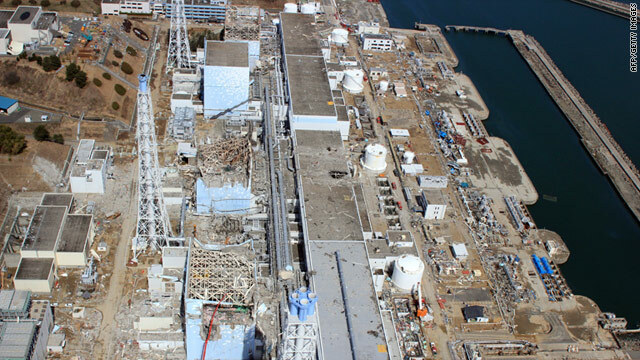 Tokyo (CNN) -- Tens of thousands evacuated from around the stricken Fukushima Daiichi power plant may not be allowed home for months, a Japanese minister said Friday, with no end in sight for the nuclear crisis as fresh concerns mount about alarming radiation levels in beef, seawater and groundwater. While he didn't set a firm timetable, Chief Cabinet Secretary Yukio Edano said people who'd lived within 20 kilometers (12 miles) of the nuclear facility would not return home permanently in "a matter of days or weeks. It will be longer than that." "The evacuation period is going to be longer than we wanted it to be," Edano said. "We first need to regain control of the nuclear power plant." The plight of the evacuees and those within a 20-to-30 kilometer radius of the facility, who have been told to stay indoors and encouraged to leave, is one of many storylines still playing out in relation to the crisis. Many are rooted at the northeast Japan power plant where dozens of workers, soldiers and others are rushing to prevent the disaster from worsening, while further afoot farmers, citizens and officials are dealing with the effects of already released radiation. That includes news Thursday, from Japan's health ministry, thatradiation higher than the regulatory limit has been found in beef from Fukushima prefecture, the same province as the embattled nuclear plant. The levels were slightly above the guidelines set by Japan's Nuclear Safety Commission -- 510 becquerels (a measurement of radioactivity by weight), compared to the official limit of 500 becquerels. For reference, Japan earlier set a 100-becquerel threshold at which infants shouldn't drink tap water, with a 300-becquerel maximum for adults. The meat will not be sold and will be retested, the ministry said. The finding is the first such in beef, although authorities have banned the sale and transport of numerous vegetables grown in the area after tests detected radiation. Cesium 134 loses half its radiation every 2.1 years, notes the Argonne National Laboratory in Argonne, Illinois. Cesium 137, experts have said, has a half life of 30 years. Cesium 137 levels have also spiked in ocean waters off the nuclear plant, the nation's nuclear safety agency. A Wednesday afternoon sample showed levels of 527 times the standard. Because of its long half life, experts have said its presence is worrisome. "That's the one I am worried about," said Michael Friedlander, a U.S.-based nuclear engineer, explaining cesium might linger much longer in the ecosystem. "Plankton absorbs the cesium, the fish eat the plankton, the bigger fish eat smaller fish -- so every step you go up the food chain, the concentration of cesium gets higher." Also, the amount of the radioactive iodine-131 isotope in the samples, taken Wednesday some 330 meters (361 yards) into the Pacific Ocean, has surged to 4,385 times above the regulatory limit. This tops the previous day's reading of 3,355 times above the standard -- and an exponential spike over the 104-times increase measured just last Friday. Officials have downplayed the potential perils posed by this isotope, since it loses half of its radiation every eight days. Still, authorities don't know where the highly radioactive water is coming from, how it reached the sea or how it might be stopped. On Thursday, Hidehiko Nishiyama, a Japanese nuclear safety official, reiterated that seawater radiation doesn't yet pose a health risk to humans eating seafood. Fishing is not allowed within 20 kilometers (12 miles) of the plant, and waterborne radiation should dilute over time, Nishiyama said. Another emerging problem involves the detection of high levels of radioactivity in groundwater and soil near the plant. Early Friday, an official with the Tokyo Electric Power Company -- which operates the plant and heads the recovery effort -- said that iodine-131 levels in ground water from a pipe near the No. 1 reactor had 10,000 times the standard limit. But the utility later backtracked, promising to get more clarity later. Edano addressed this confusion in a press conference later Friday, noting that further tests of groundwater are forthcoming. "The numbers released ... looked strange, and that led to the recalculation," he said. "In either case, underground water seems to contain some level of radioactive substances, and this leads to an understanding that the ... soil in the vicinity needs to be monitored closely." All this contamination -- both into the ground and, eventually, the sea -- is the result of a leak or some other sort of ground seepage from one of the nuclear plant's four most embattled reactors, a Tokyo Electric official said Thursday. The official noted that the high levels suggest the release of radiation into the atmosphere alone couldn't be the lone source. CNN's Kyung Lah, Yoko Wakatsuki, Junko Ogura, Larry Shaughnessy and Paul Ferguson contributed to this report.